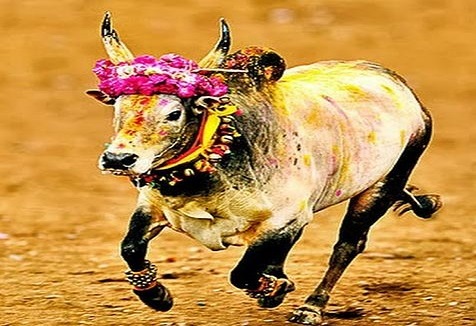 Jallikaatu could be referred to as bull taming event typically practiced in Tamil Nadu as a part of Pongal celebrations on Mattu Pongal day, the third day of the four-day Pongal festival. The term ‘jallikattu’ is derived from the Tamil words ‘jalli’ and ‘kattu’. Jalli refers to gold or silver coins. Kattu means ‘tied’. Therefore, combined together it refers to coins being tied to the bulls’ horns, which is considered the prize for whoever tames the bull. The bull that wins is used to service numerous cows preserving the native breed. It is renowned as an ancient ‘sport’, believed to have been practiced some 2500 years ago. It is controversial because the sport often results in major injuries and even deaths. It is somewhat similar to the bullfight but the animal is not harmed or killed here. It has been going on for centuries in Tamil Nadu and essential part of the culture here. 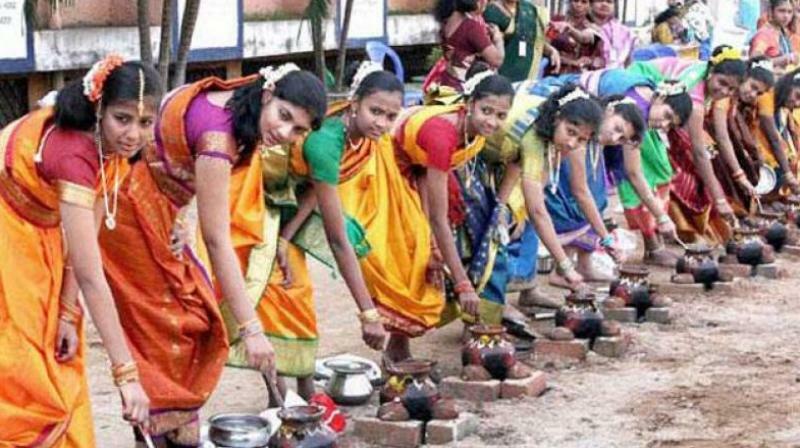 Pongal the harvest festival has much interesting stuff like, eating Pongal dishes both sweet and salt based, decorating the house with colorful Rangoli, having sugarcane, taking care of animals, birds and thanking basically all that which produces a good harvest. Thanking Sun god for Sunlight, Animals especially cattle, keeping food for birds all this happen on the second day called “Maattu Pongal”. Cows and bulls are painted attractively on this Maatu Pongal day. Jalli Kattu is a part primarily of this day when bull fight/(Sport with bull) happens, then fighters who are successful are given prizes. This is a part of the ancient culture called “Kaalai adakkuvadhu” wherein men prove their valor through such participation, prizes and winning. Kaalai means the Bull in the Tamil language. Hundreds of bulls are specifically identified, trained and nourished for the sporting event, by organizers of Jallikattu and bullock-cart race, as a traditional practice associated with village life, mostly in the southern districts of the state. As part of the tradition, after the event, weak bulls were used for agricultural purposes, while the stronger ones were used to breed cows so that the wild nature of the bulls were inherited in the next generation. The rules of the sport say that a bull tamer will be awarded a prize if he hangs on to the hump of the animal for a certain period of time. The incident comes a day ahead of Jallikattu celebrations at Madurai’s Alanganallur. Animal welfare concerns are related to the handling of the bulls before they are released and also during competitor’s attempts to subdue the bull. Practices, before the bull is released, including prodding the bull with sharp sticks or scythes, extreme bending of the tail which can fracture the vertebrae, and bite of the bull’s tail. There are also reports of the bulls being forced to drink alcohol to disorient them, or chili peppers being rubbed in their eyes to aggravate the bull. During attempts to subdue the bull, they are stabbed by various implements such as knives or sticks, punched, jumped on and dragged to the ground. Invariants in which the bull is not enclosed, they may run into traffic or other dangerous places, sometimes resulting in broken bones or death. Protestors claims that Jallikattu is promoted as bull taming, however, others suggest it exploits the bull’s natural nervousness as prey animals by deliberately placing them in a terrifying situation in which they are forced to run away from the competitors which they perceive as predators and the practice effectively involves catching a terrified animal. Along with human injuries and fatalities, bulls themselves sometimes sustain injuries or die, which people may interpret as a bad omen for the village. However, with protest from the people against the ban, a new ordinance was made in 2017 to continue the sport.